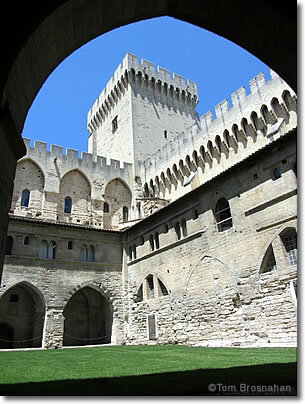 The largest Gothic palace in the world, the Palais des Papes is a symbol of Avignon. During the Middle Ages Avignon was the center of Christianity in Europe. In the 14th century, it became the home of the popes, starting with Clement V in 1305 and continuing throughout the century. Under these popes—many of whom were French—Avignon grew and thrived. Huge construction projects ranging from churches and chapels to the university to the Palais des Papes resulted in splendid architecture, much of which remains today. The Palais des Papes, the largest Gothic Palace in the world, allows visitors to see sumptuous ceremonial halls, chapels and cloisters, and the private apartments of the popes. Remember it's huge, and you'll be walking and visiting a variety of areas. You'll also be able to admire the architecture of the massive structure. Construction began in 1335, and the Palace was built in less than 20 years, largely under the direction of Popes Benedict XII and Clement VI. Au audioguide is available and can be helpful for keeping track of the many rooms and works of art that you will see. 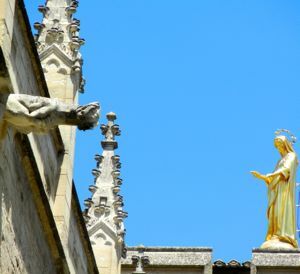 THe Cathédrale des Doms is just next to the palace, and is noteworthy for its golden statue of the Virgin Mary. Originally built in the 12th century, it was reconstructed in the 17th century. It is still the main church for the Bishop of Avignon. Just above the palace and the cathedral is the Rocher des Doms, or the Doms garden. 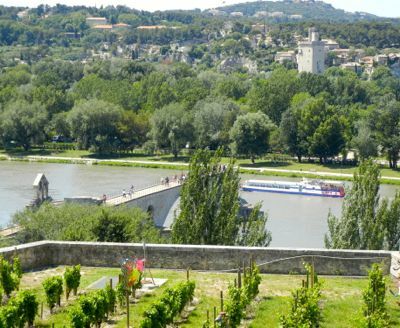 These lovely gardens offer views of the town and the Rhône, and you can stroll to the Pont d'Avignon through the gardens and along the ramparts. As you walk you'll be reminded that the French popes loved their wine. Small vineyards adorned with colorful scarecrows dot the hillside, providing a backdrop to the view of the Pont d'Avignon. Although these vines were introduced in the late 20th century, the 14th century popes did much to advance the Côtes du Rhône viticulture. Pope Clement V had formerly been Archbishop of Bordeaux, so he appreciated wine. He and the succeeding Avignon Popes were said to be partial to the wines of Burgundy, but they also did a lot to encourage the Côtes du Rhône; there's a reason that Châteauneuf-du-Pape is a famous wine, even today. Châteauneuf-du-Pape is just 17 kilometers (11 miles) north of Avignon. The Palais des Papes today stands as a splendid reminder of a fascinating period of Catholic history. Both legitimate popes and schismatic popes reigned there in the 14th century, and they certainly left their mark on Avignon and the region. Above, A small part of the grand Palais des Papes. Below, Detail of the Palais, with the golden statue of the Virgin of the Cathédrale des Doms.